I am grateful to have known many unheralded people who have committed themselves to working for marginalized groups in our country. They are advocates and co-journeyers, dedicated to a life of service to the people. They are the teachers, companions, community organizers who would exemplify magis, giving more of themselves in the service of others. I am thankful to fellow human rights defenders who have worked tirelessly for the plight of the survivors of human rights violations including the families of the desaparecidos. I am likewise grateful for having worked with different groups and organizations who have supported survivors of calamities and difficult life experiences. Patnubayan kayo ng Panginoon sa inyong mga gawain. There are still many others, who may not be members of groups working with the marginalized but continue to help others in simple acts of kindness. They are brothers, sisters, mothers, fathers, uncles, aunts from all walks of life who gently touch the lives of others with their kind words and deeds. I remember the many kind people who volunteered their time, rendered financial and material support to the survivors of critical situations and disasters in our country. Some even cooked food and delivered them to flood survivors in various communities. Others would journey with farmers and indigenous people coming all the way from remote communities in the provinces to seek audience with responsible leaders on their plight. Many others would provide a gentle and compassionate ear to many who have experienced a loss too painful to bear. A great number provided caring activities for children in evacuation centers, providing them a safe place to be able to express themselves through play and art. I am humbled yet strengthened by their compassion and kindness. This Christmas season, I came across many more of the people who have displayed the true essence of the season through their simple acts of kindness, generosity, compassion and love. I was able to reconnect with a kind-hearted person, my sibling Minx, who supports committed artists and students. I got to know Filipino artists like Boholanon Lola Nene Lungay through her. Lola Nene, at 83 years, still creates beautiful oil and watercolor paintings depicting authentic Filipino culture and tradition. Salamat, kapatid ko sa pagkakataong makilala si Lola Nene at lalong makilala ang kabutihan ng iyong puso. I learned about the 1000 Bear Hugs project from journalist and fellow mother Cathy Babao. Cathy has been involved with several projects for the children and the grieving. 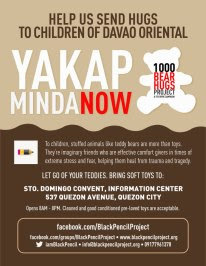 This project aims to collect teddy bears and other stuffed toys for the children survivors of the disaster in Davao Oriental. Thank you Black Pencil Project and Cathy Babao for your kind hearts. One compassionate couple I am co-journeying with, E and K have also expressed their plan to support this project as part of their 10th year wedding anniversary. Aside from this project, they plan to hold a soup kitchen for indigents this Christmas. What a beautiful way to celebrate an anniversary! Thank you to the people of Balsa Mindanao and the Rural Missionaries of the Philippines who have dedicated themselves to help those in need in Mindanao, specially the survivors in the typhoon stricken areas of Davao Oriental and Compostela Valley. I am a counselor and a co-journeyer for many others who have experienced and are undergoing difficult life situations. I am also a mother of two wonderful daughters who I hope would remain compassionate and kind-hearted as they are now. 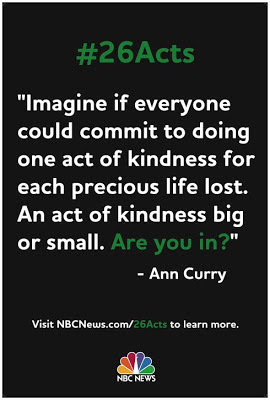 I am elated with projects like the 26 Acts of Kindness where one will be inspired to do more for others. 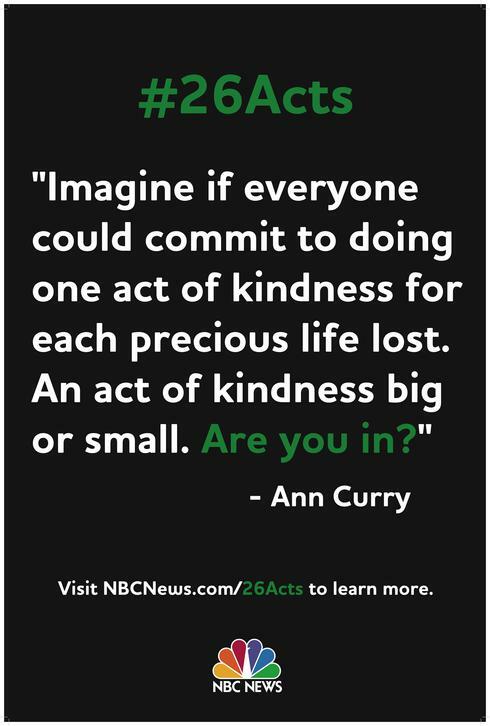 This simple yet inspiring project commits one to do 26 Acts of kindness done with love in memory of the people who were killed in a heartbreaking tragedy last week in Newtown, Connecticut. I hope people will not stop with 26; I believe this project shall create ripples in the hearts and minds of many to do more, share more and love more.